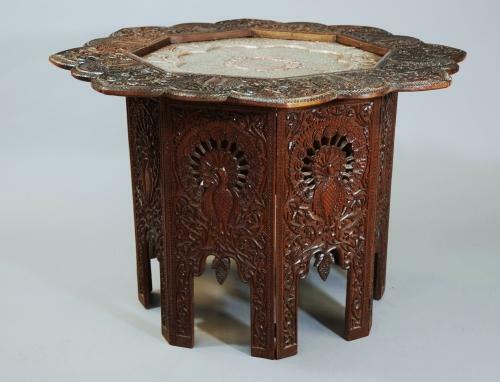 An early 20thc decorative Middle Eastern hardwood occasional folding table with a pierced copper octagonal top. The top consists of a central octagonal copper section, finely worked with pierced & engraved designs of Islamic writing & leaf decoration. This is framed by a wooden octagonal section consisting of eight finely carved peacock roundals with eight finely carved arched foliage designs either side of the peacocks. The base consists of eight identical sides, all comprising of a finely carved peacock bird design within foliage. This base can be folded if necessary & the top fits neatly on top of the base as seen in the photos. The peacock symbolises immortality & in Persia, the peacock was seen as guardian to Royalty & can be often seen in engravings on the thrones of Royalty. This table has a toughened glass panel which has been made to fit over the copper top to allow items to be placed on it without causing any damage to the piece. This makes it a more practical piece of furniture. This table is if sound construction & can go straight into a property.